Slumdog Millionaire – What would you do to get what you wanted? What would you do to be a winner? And what is the dream you’re really aiming for? This is an uplifting film about a boy’s journey through life and his struggles and challenges, culminating in being on the Who Wants To be a Millionaire show in India. It is told in flashbacks from Jamal Malik being on the show and accused of cheating. A tea-boy in a call centre, he is now on the last question to win 20,000,000 Rupees. Thankfully the film is not really about the TV show or the money, otherwise it could have been a pretty formula movie. Instead it pulls you into the film giving you an inside view of people living in the slums of India and the hardships they face daily that you wouldn’t even imagine or wish upon anyone. You feel as you are there as they run around the streets as kids, hustle for money and run along trains. Focusing on the life of one boy, his brother and the girl he falls for. Their journey over the years and a story of hope, first love and destiny. It is funny and sad and have you on the edge of your seat throughout, making you laugh, cry and feel for the characters. Reminding you of how grateful you should be for what you do have in your life every day. A heart warming film about love, life and hope. It is a wonderful story of destiny and that our fate has already been written and gives us the answers as and when we need them. Sometimes you want the answer and at other times you may wish you never knew and didn’t ever have to know. Some people are so passionate that they don’t know how to give up and do whatever it takes, like Jamal, hopefully you are one of them too! Live, laugh and love your way through life; because it is already written! You just have to believe it and not give up on your passion and that which you hold dear. What is already written for you and what will you write for tomorrow!? 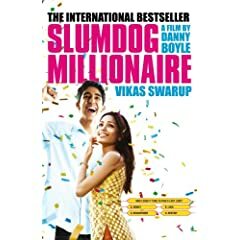 Based on the book Q and A: Slumdog Millionaire by Vikas Swarup.